Rats and mice can be not-so nice! Rodents have a list of negative impacts when they invade people’s structures. They are a nuisance, destructive to property, are disease carriers, and contaminate food. Rodents are known to contaminate a considerable amount of the world’s food supply with at least 20% of that supply being affected. Their two pairs of incisors continuously grow and require eating and gnawing to keep them worn down. 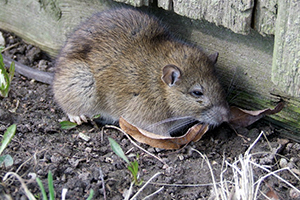 The roof rat is the smaller of the rat species. It is 6 to 8-inches in length with a tail that is 7 to 10-inches long. It has large eyes and ears and a pointed muzzle. Signs of infestation are gnawing marks, fresh droppings, damaged goods, runways, tracks and greasy rubbing markings. The roof rat has poor vision and is colorblind but has a good sense of hearing, smelling, tasting and touching. Transmitted diseases include bubonic plague, Weil’s disease, rat-bite fever, trichinosis and food poisoning. The roof rat is normally nocturnal and is cautious, staying away from new objects for a while. A roof rat can squeeze through a hole that is half an inch in diameter, leaving many structures vulnerable to infestation. The way to control these rodents is by sanitation, rat proofing the building, elimination of the nest and snap trap placement. The Norway rat is the largest of the commensal rodents being 7 to 9 ½-inches in length with a tail that is 6 to 8-inches in length. This rat has a stubby snout with small eyes and ears. Signs of infestation include gnaw marks, fresh droppings, damaged goods, runways, tracks and greasy rubbing markings. The Norway rat has poor vision and is colorblind but relies on a good sense of hearing, smelling, tasting and touching. They are good runners, jumpers, swimmers and climbers. The Norway rat is cautious and shy and will stay away from new objects for a while. Norway rats will normally nest in basements or in lower portions of undisturbed piles of debris. These rats prefer meat, fish and cereal but will eat mostly anything. 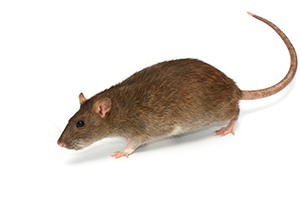 Control of these rodents is best achieved by sanitation, rodent proofing the structure, elimination of the nest and possible snap trap placement. 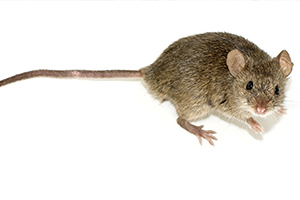 The house mouse is the most commonly encountered rodent. This rodent is about 2 ½ to 3 ½-inches in length with the tail measuring an extra 2 ¾ to 4- inches in length. The house mouse has a pointed muzzle with small eyes and large ears. Signs of infestation include gnaw marks, fresh droppings, damaged goods, runways, tracks and greasy rubbing markings. Mice prefer seeds or cereals. Mice are also very social. They will show aggression towards strangers of their kind. They are also very curious and will explore new things and change their routes frequently. A mouse will only require a ¼ inch hole to enter a building. Nesting sites are dark secluded areas made up of paper, cotton, packing materials and fabrics. The way to control these rodents is by sanitation, rodent proofing the building, elimination of the nest and snap trap placement.